Those addicting eyeballs are out to get you again and this time, you get to share the fun with friends. 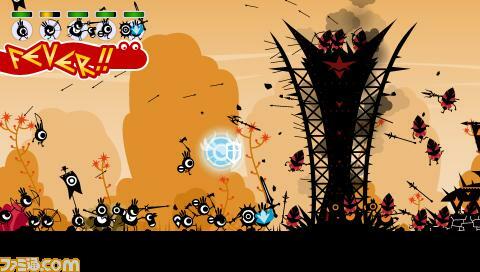 Yep, Patapon 2, set for August release, has Ad-hoc multiplayer for four players. Four times the fun, and four times the challenge. In a recent interview by Famitsu with creator, Hiroyuki Kotani explains (via 1UP) that there’s a lot more to look forward to this time besides multiplayer. People who didn’t like the first game because it was challenging (really?) will probably opt out of Patapon 2. In any case, here’s a screenshot from the game, you can see more via famitsu.